Guess what? 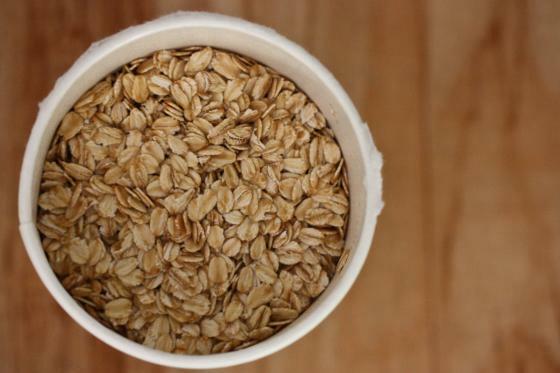 Oatmeal just got waaaay cooler. I mean, oatmeal is cool and all. 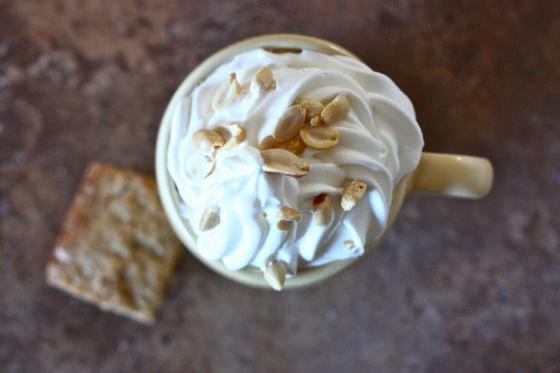 Especially on chilly mornings and especially when loaded up with every topping imaginable. It’s also pretty cool in cookie form. But what’s not cool in cookie form? 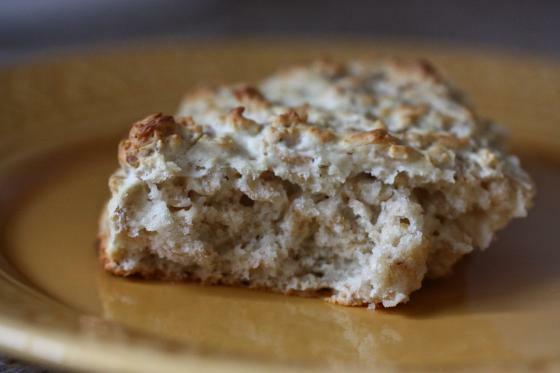 Today though, I want to present you with these fifteen minute oatmeal scones. They’re flaky, they’re crusty, and they go really, really well with spicy acorn squash bisque. They also serve as lovely vehicles for dark chocolate sandwiches. Ladies and gentlemen, start your timers. Fifteen minutes. Ready, set, GO! Mix dry ingredients: 15 seconds. Cut in butter: 20 seconds. Pour in milk and make a wet, shaggy ball: 1 minute. Pat down on a baking sheet: 15 seconds. 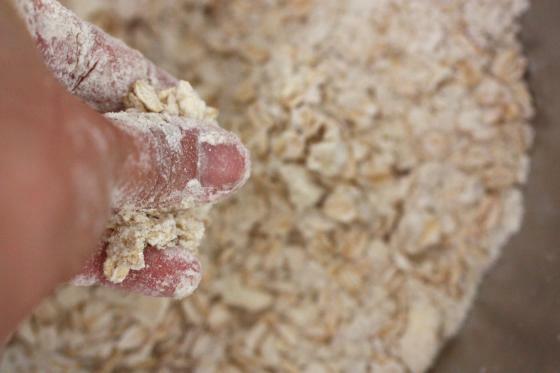 Mix together the oats, salt, baking powder and flour in a large bowl. Cut in the butter and work with your fingers so the mixture resembles cornmeal. Pour in the milk and stir only until combined. Pat sticky ball down on a lined baking sheet and bake at 475 for twelve minutes, or until golden. Try one crumbled into a warm bowl of white chicken chili or topped with a poached egg and Canadian bacon for a spin on a classic! Love scones! 15 minutes is worth a try! A fast post for a fast recipe. Love it. So, do you cut it into four pieces after you bake it? Or divide it and then bake? you can run a knife down the dough before you bake, or you can just cut into four sections after you bake! I love scones so it makes me immensely happy to know they’re so easy to make. Um, hello! Those look awesome! Putting on my to-do list for this evening! Nom nom nom – these look awesome! i am baking challenged but i think i HAVE to make these. they appear foolproof and awesome. ok, question. how would whole wheat pastry flour work in place of ap? you could try! They might not be as fluffy though. Anyway-when you first decided to focus on your goal of being a food writer and writing more recipes and less daily life, I was creepily sad! But, long story short, you have amazed me with not only your writing but entertainment skills!!! no excuses, i dont cook half as much as i would like or should, but boy do you make it fun to read about!!! Keep up all of your hard work-it is paying off! These would be great to incorporate into an early morning big breakfast. hahah i felt like i was gonna get whooped if i didnt finish reading this fast enough!!! That’s about the most perfect recipe for me! Oats = love. Fast = more love. Easy = extra love. seems too good to be true! But i love it, can’t wait to try! 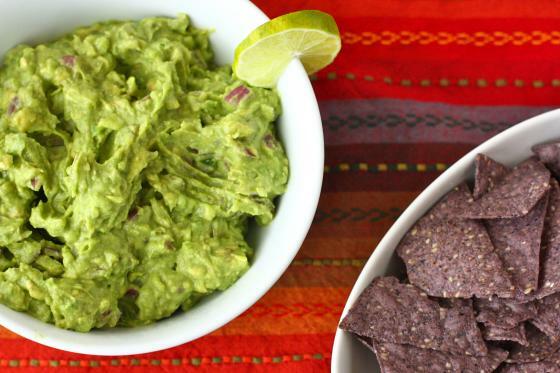 Yum, these look healthy and delish! Thanks for sharing your recipe!! 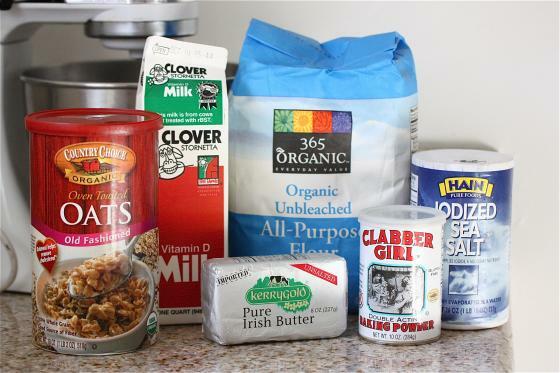 Baking question please: if one is developing a recipe, whats the flour (or oats..) to baking powder and baking soda ratio? Why do some recipes only call for baking powder and not baking soda? If you add baking powder you always need salt, right? Is there a common ratio of baking powder to salt always used? Sorry for the multiple questions, but Ive always wondered about this baking soda and powder stuff. Sometimes I bake with baking soda and the finished product tastes a bit like baking soda…i guess some sorta reaction?? Thanks! Yum to banana puddin, I hope to master that one day too. I made BOTH the soup and the scones today and LOVED them!!! Thanks for the yummy and easy treats! 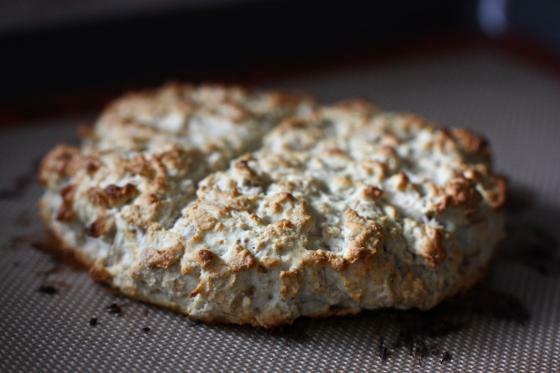 I loved that i had all the ingredients in my cupboard and that the scone recipe only made 4 healthy scones. 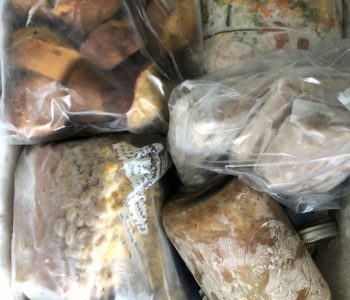 This way I dont eat like a dozen scones 🙂 OR have to freeze ’em. My daughter ( 16 mo) enjoyed the soup for dinner and lunch. Thanks again, I will for sure make them again soon!! Those sound great! Nice for a last minute addition to dinner! 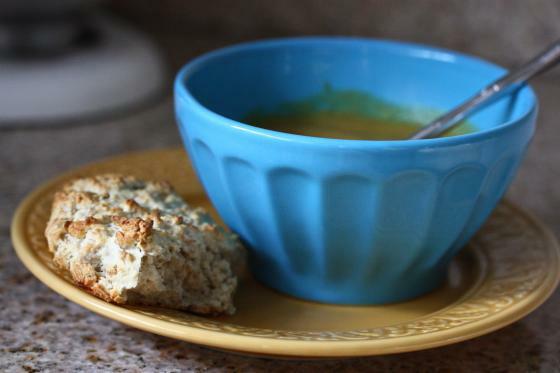 Those scones look great and that soup sounds even better! 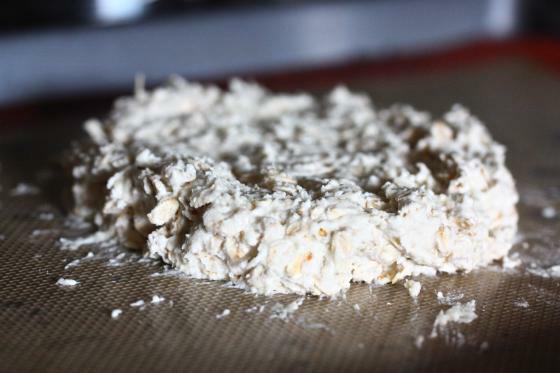 : ) I love the fact the scones only have a few ingredients and are ready within no time! Those look fantastically rustic & delicious! I’ll have to give them a try! I just made these. I’ve read your blog for awhile and never really commented OR attempted to make one of your recipes step by step. But I did this one since it’s so quick and I had all the ingredients on hand. Results? AMAZING!! I felt like the best baker ever! Seriously, I can’t wait for my husband to try them. The only difference is I put mine in 4 blobs, rather than one big blob, so that I had 4 scones. I didn’t pat them down either and they were nice and fluffy. Love this recipe. I think it’s time for a tea party with scones. I bet those would taste nice with some olive oil and rosemary baked in. I’m going to fold in some nutella and call it a day 😉 I love your plates, by the way! I’m sure you’ve mentioned it before, but where are they from? Definately will be making these for your father 🙂 Love that you use the Irish butter! 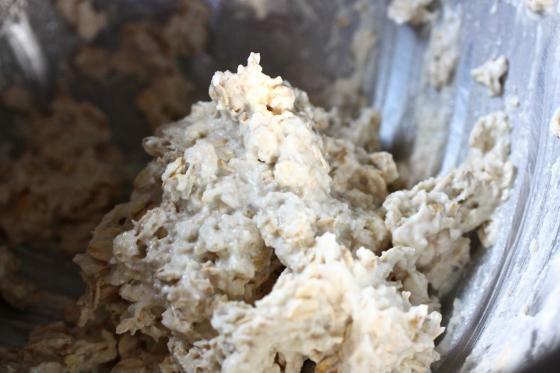 A quick spin on oatmeal sounds completely delicious! These sound too good to be true! What!? It is too easy! Love it, quick simple and can go with anything. I’m making them right away. 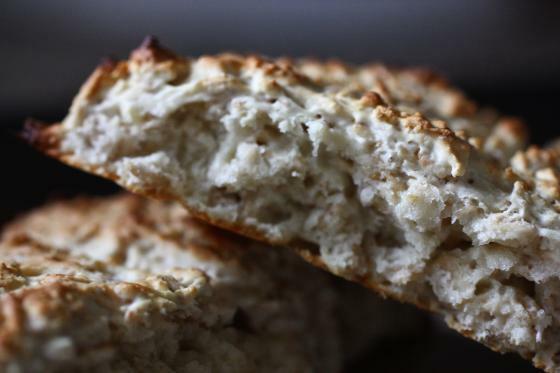 These look like the perfect healthy scones! And I’m back to report I made them tonight, as promised, and holy cow, are they good! Even the fiance who never says much about baked goods remarked how good they were! I can’t believe how easy these are! These are freaking delicious. 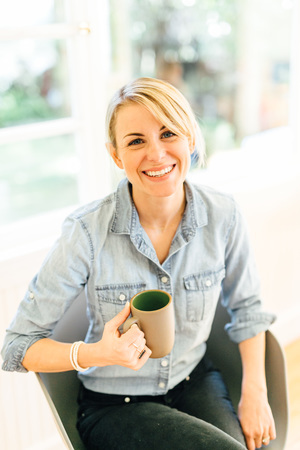 I just had a baby and am looking for “whole food” things to have around the house (one can only eat so many granola bars) to eat when I have my hands full with the baby. Bonus: I made these while he napped on my chest in the baby carrier. 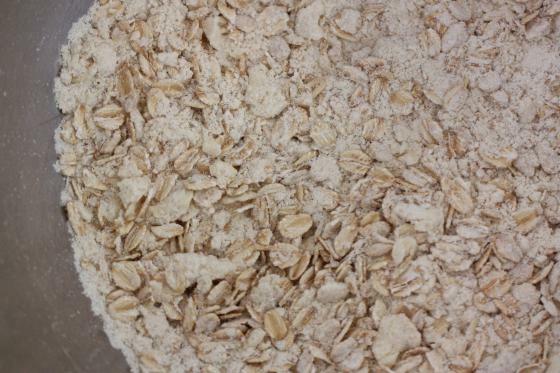 Bonus Part II: oatmeal is rumored to help keep milk supply up, even in baked goods. I had one with honey and I’m definitely going to have to make another batch tonight because I have a feeling these four are not going to last. hey there! : ) this was great! I dubbed in vegan butter and rice milk and it came out just great, little less cookin’ time though. This looks like a total winner – breakfast, lunch, dinner, snack – I’m in! looks so easy to do…love how not-intimidating they are! Scones make me think of a sophisticated baked good that only bakeries can do well. This looks do-able! GREAT photography! Great, quick recipe too! wow, i’m impressed! who knew you could do so much with so little time? these look wonderful. i love scones! Those sound really good. Thanks for sharing! I know that this is quite off subject but its ok because it is about books 😛 I am an avid reader, like yourself, and I was just wanted to suggest to you the Hunger Games Trology. They are very good. I read the first one in nearly one sitting! Love. These look delicious! Could you make a sweet version by adding some sugar and vanilla? Also, I roasted some kombucha squash and made the same salad you made a week or so ago. Perfect fall dinner! Thanks, Jenna! I’m digging this idea! These would be great with a big brunch. Make people think I was slaving away making homemade scones. PERFECT. How simple and yet so lovely. I’m going to make this tonight and enjoy a scone with tea and a side of Glee! Gracias Jenna!!! Oh i looove scones.. and those are actually fairly healthy! Those scones look perfect as a side for a bowl of soup, the chicken chili sounds like a great idea! I often find myself wanting to bake something but thinking I don’t have time to do it but I am saving this recipe for precisely those times! These are so good! I made them vegan by substituting almond milk and Earth Balance, and they turned out great. Mmm… I really want to try these. Oh yay…another Jenna recipe to try. I think I’m partial!!! You know what takes LESS than 15 minutes? Family coming tomorrow night. Chili? Made. Scones would be the perfect addition. Thanks! I just made these and had one right out of the oven for breakfast! It was wonderful. Usually, I’m waaay too hungry in the morning to prepare creative/time consuming dishes so I loved how quick these were. Thanks for the recipe! I am such a scone fan and want to try these tonight. Problem is, I only have quick cook oats in the cupboard. Jenna, will that ruin the recipe? Hi. I tried your recipe last night. Actually, I tried a half recipe so there would be two scones for the two of us. Easy, a great way to heat up the house on a cold night using the oven, and really delicious with pumpkin butter and greek yogurt on it. I substituted white whole wheat flour which doubles the fiber content. Thank you for this and the other yummy recipes you share! Holy scones, Jenna! These are a-ma-zing. I added a tablespoon of chopped fresh rosemary, and we just had them with dinner. They’re quite possibly the easiest and tastiest scones I’ve ever made. you know, i really appreciate it that your recipes are for servings of 4. thanks for making recipes for the rest of us who aren’t a party of 6+! Jenne, I just made these tonight! So delicious! they were like a new & improved biscuit! I love knowing that I can always count on your recipes to be delicious. Gotta admit, some blogger recipes are hit or miss, but yours are always a hit! Just curious, do you use table salt or kosher salt in your baking? Does it make a difference? These were ridiculously delicious. I burnt my tongue on them because I couldn’t stop eating them even though I knew they were hot. Thank you for adding some delicious-ness to my tuesday night! These are my go-to “my tummy kinda hurts” snack! Making a batch now! Thanks for this recipe. Fifteen Minute Wonder « Life Undeveloped. Like your recommendation to add to chili or poached egg, nice! This is a great recipe alone and to be adapted. I made my first batch with whole wheat flour and they were wonderful. Second batch with chopped nuts and dried berries also delicious. Apple and cinnamon is next! Thanks! I might cut back on the salt a little next time. SO YUMMY! 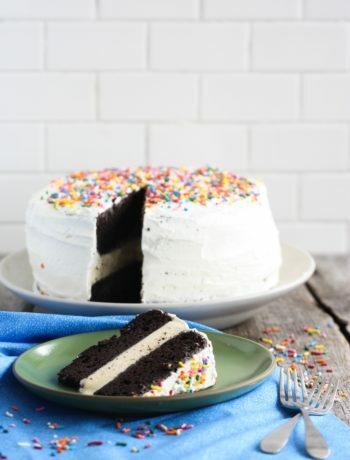 I’m so tempted to try other variations…savory, sweet and everywhere in between! I know I already commented on this post but I have to tell you that these are seriously my go-to recipe for breakfast and dinner. They are so easy and perfect! thanks Jenna! I have a batch in the oven right now. I’m out of milk so I subbed water – I know they won’t be as good but I’m hopefully they’ll be passable! Sunday Scones « Yes, I want cake. Made these last night and they’re fantastic! Quick and easy to make with a great result. Little salty, and just the right texture. I love this recipe! I found it a while ago and made it in the past, and had forgotten about it somehow. I made some white chicken chili in the crock pot today for a quick and easy dinner and thought some sort of roll or baked good word be delicious with it. Luckily, I remembered these scones and am so glad I did because they are the perfect side and stayed in line with my quick and easy dinner! Thanks for sharing these with us! This looks fantastic. My dad just requested scones. Would you be able to add blueberries to this easily? Or would it mess it all up? Thanks again!! I baked these last night & all had was reg oatmeal. They came out wonderful and they were so easy and quick to make. I added 2Tbs brown sugar splenda, & 1/2 tsp cinnamon in the sconesthen after they cooled I put cinnamon glaze on them. They were awesome. Next time I’ll use wheat flour and some dried fruit & chopped nuts. This is a keeper. My mother in law brought me some self rising flour (inside joke). So I used it today with these scones! Thu were so fluffy and light. Yum! Great for breakfast with butter and honey or jam.